Read on to learn the secrets of telemedicine companies, and why you might benefit from this incredible service! Has your company considered partnering with telemedicine companies to resolve worker issues more quickly and with less time spent out of the office going to appointments? Wellworks For You brings an innovative solution to much of the inefficiency that individuals and businesses regularly deal with, offering you a telemedicine package through our partner, Wellvia. Did you know that 70% of all doctors’ visits could be just as effectively conducted over the phone? Phone calls save resources and time waiting for an appointment when the issue does not require an in-person visit. Read on to learn more about what telemedicine companies offer and the benefits of this rapidly growing field. You may not have heard very much about telemedicine previously because, though it’s existed for the last 40 years, it hasn’t been in force around the world until the past ten years or so. The lack of awareness about telemedicine as a field may be partially due to the fact that it is difficult to be licensured in telemedicine. Because of the lawsuit possibilities, physicians must follow stringent regulations. Because state boards are responsible for each state’s healthcare licensing, that means that practicing over state lines had required health systems to license their doctors in every state. However, now in the USA, EU and many other countries, telemedicine is now regulated at the highest level of governmental standards. 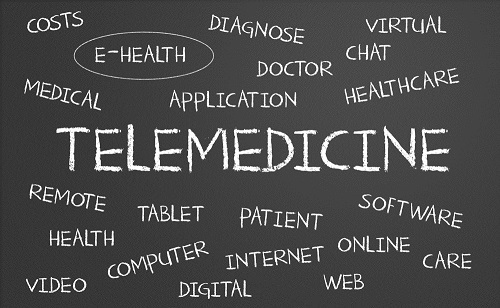 What technologies are involved in telemedicine? Patient consultations may be conducted over video conferencing, with use of other data collection technologies such as transmission of still images, remote monitoring of vitals, and patient portals for easy access to data. The average wait for a doctor’s visit has been calculated at 18.5 days for specialties and 19.5 for regular family doctors! Considering that you will probably sit in the waiting room for 20-30 minutes and then maybe get an appointment for only that long. Then factor in the time it took you away from your work to get there, and you’ll see that healthcare ends up meaning a lot of wasted time with a short period in-person contact to boot. But with our package, you’ll get a call back in an average 16 minutes! Doctors are only available during the days, and after hours all you get is an answering service which may or may not transmit your message to the doctor right away. Telemedicine is available through our Wellvia package 24/7! When you have an urgent medical concern that takes place after hours, will you want to drive to the emergency room?…Or just call us? You don’t sacrifice quality for convenience. All of our doctors are licensed according to the highest standards and have an average of 10 years experience. In addition, we are accessible in EVERY state! In offering the most comprehensive services possible for corporate wellness, Wellworks For You brings an integrated approach to health and wellness by partnering with one of the top telemedicine companies in the country. Save time and money in healthcare costs by offering this valuable service to your employees. If you’d like to learn more, call a Wellworks For You representative and ask about “telemedicine services” at 800.425.4657.